At Lab Supply, we are committed to making sure our customers receive the best equipment to protect from health and safety hazards. 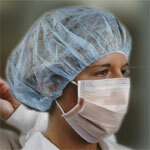 Lab Supply carries a great selection of caps, gloves, gowns, masks, shoe covers and sleeves from Life Science Products. Life Science Products, Inc. is a premier service provider for the best in Laboratory Equipment and Supplies. This entry was posted on Thursday, September 18th, 2014 at 5:06 pm and is filed under News & Updates. You can follow any responses to this entry through the RSS 2.0 feed. You can leave a response, or trackback from your own site.